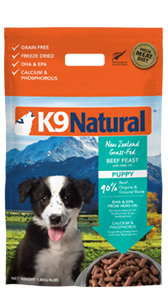 Inspired by our beautiful New Zealand environment, and guided by world leading science, K9 Natural provides the Best Blends of Nature in nutrition for dogs. Combining only the best ingredients, we have created a high meat diet packed with energy and nutrients. Taste is also a top priority, we only source sustainable, free-range and grass-fed ingredients to create a truly unique blend that your pet will crave. Integrity is important to us. All our wholefood ingredients are sourced in New Zealand and then carefully combined in our state-of the-art facilities to provide the best and safest food that the world has to offer. Your dog will love the natural goodness of a high meat diet. It is what they are instinctively drawn to and what their bodies are designed for. Our food is healthy, natural, and nutritionally balanced. Made fresh, it provides a delicious, high meat boost for your pet. All of our diets are backed by world class research from our in-house animal nutritionist who works alongside leading animal research institutions. We believe we’re leading the way in natural nutrition through our carefully balanced diets to ensure your pet’s optimum health and wellbeing. Better health through better nutrition. 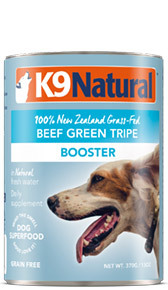 K9 Natural supports weight management, improves digestive function and boosts skin and joint health. Dogs love the taste of a natural high-meat diet. We source an abundance of nutritious, wholefood ingredients to create a truly unique blend that dogs crave. Our grass-fed sources provide the rich and nourishing fats and proteins needed to give dogs a natural source of energy to thrive. 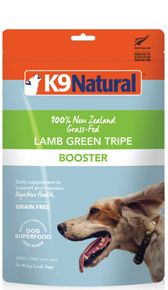 We have created a diet that contains everything a dog needs, whatever breed or stage of life they may be at. 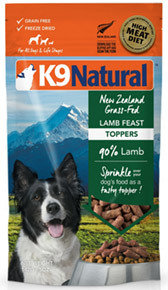 For ultimate peace of mind K9 Natural core diets are complete and balanced and meets all AAFCO requirements.